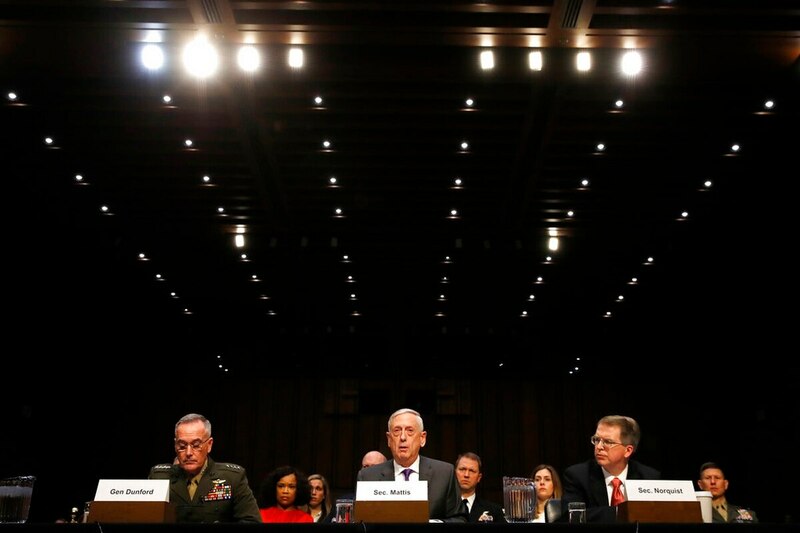 WASHINGTON — The U.S.-led coalition is about to accelerate its fight against the Islamic State group in Syria and Iraq, Defense Secretary Jim Mattis said Thursday. The battle slowed in recent months after Syrian Kurdish fighters, who have been the main American proxy in eastern Syria, switched their attention to fighting Turkish forces in western Syria. Mattis’ comments appeared to suggest that this pause is coming to an end, although he did not discuss specifics. The Pentagon chief was responding to a question from Sen. Jeanne Shaheen, D-N.H., who asked whether President Donald Trump’s recent comments about withdrawing from Syria meant the U.S. would leave before finishing off ISIS. “Right now, senator, we are not withdrawing,” Mattis said. “In the days ahead,” he added, “you’ll see a re-energized effort” in the Middle Euphrates River Valley, where remnants of ISIS are holding out. He said “you’ll see increased operations on the Iraq side of the border,” without elaborating. Sen. Lindsey Graham, R-S.C., asked Mattis whether conditions on the battlefield would determine the timing of a U.S. troop withdrawal from Syria, or whether Trump is talking about a withdrawal because he’s just tired of Syria. “As you know, neither the last administration nor this administration sees itself occupying Syria,” Mattis said.